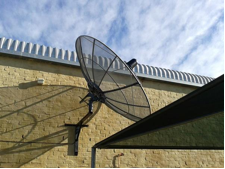 It was mentioned in the November issue of the FynbosFire newsletter that satellite dishes and computer systems are in the process of being installed at the offices of the Cape Peninsula, Greater Overberg, Greater Cederberg and Southern Cape FPAs. The installation process has by now been completed and the various FPAs are currently harnessing this technology to detect fires in their areas. Exciting news is that second generation software is currently being developed, which will be made available to the FPAs this coming September. The new software will allow for better functionality and many new features and functions. These include fire alerts, high fire danger index alerts, improved accuracy in terms of weather data and a reporting tool for specific dates, areas or a combination thereof, just to mention a few. FPAs will as a result have faster response times to fires, improved fire danger predictions from a climate and vegetation point of view, and the upgraded system will provide them with more comprehensive statistics, which can aid future funding and sponsorship prospects. It also supports the mapping of fires on private and state land. “The use of space-age technology is very exciting and what was presented by developer Philip Frost, will be an excellent tool to implement integrated fire management in our region,” said Paul Gerber, managing director of the Southern Cape FPA. For more information on AFIS, please log on to www.afis.co.za.